Hope you all had a great weekend. On Saturday I Instagrammed the above pic of my makeup look for a special event. I was the emcee for a fundraiser concert to benefit a local group that helps the homeless- The Lighthouse Shelter. I did this last year and am glad to have kept a connection with the group since leaving the TV station. The founders and volunteers do incredible work- not just providing food and shelter for those in need, but truly helping them get back on their feet in terms of employment. I love supporting this cause and there was a really great turnout Saturday! As far as the face makeup- this is something I want to do a video on. I went very full coverage using Estee Lauder Double Wear Foundation, and I used some cream-based products to contour and highlight. I'm loving MAC's Pro Sculpting Cream in Pure Sculpture to use around the nose & cheekbones, as well as Mally's Under Makeup Highlighter. I then reinforced those steps with powder, as well as bronzer and highlight in powder forms. I've also been enjoying using two types of highlights- a less shimmery one like Wet n Wild Reserve Your Cabana for pore-prone areas like the nose and cheeks/cheekbones, and a more shimmery one for the cupid's bow and brow bones like The Balm's Mary LouManizer. I know I can get by with less product and coverage, but since I was on a stage under bright lights, I wanted to use these highlighting and contouring techniques to my advantage. This isn't a great pic of the eye (should have taken more pics but started running out of time, oops! )- but the eye really wasn't that complicated. I went light to dark on the lid, starting with Virgin in the inner corner, then to Sin, then to the sparkly Sidecar shade over the majority of the lid. I blended the matte brown Buck in the crease, and blended a tiny bit of Toasted above that. I used Darkhorse for the outer corner and also smudged it below the eye. I once again used Virgin as my under-brow highlight. Now for the red lips! This shade is not playing around, my friends! It's from the Maybelline Vivids Collection and it's called On Fire Red. It's definitely one of the more bold red lipsticks that I have in my collection... one of those "LOOK AT ME" colors, for sure. This was all I used on my lips, and I applied it with a lip brush for a precise application. Despite all the talking I was doing at this event, I didn't need to reapply. (Granted, I wasn't really eating or drinking much). This creamy shade has a little shine to it, but once you've been wearing it for awhile and it kind of "sets" into your lips, that shine seems to go away. I think this could be very tricky to wear (getting on your teeth, fading outside the lip line) if it is OVER applied. It really doesn't take much for this product to pop on your lips, so don't bother making multiple passes over them with this lipstick. Because it has a shine- it can become hard to manage, so apply just enough to get your desired color and it'll actually have nice staying power. I hope that made sense. Oh here's how I could have summed that up- less is more with this lipstick! LOL. 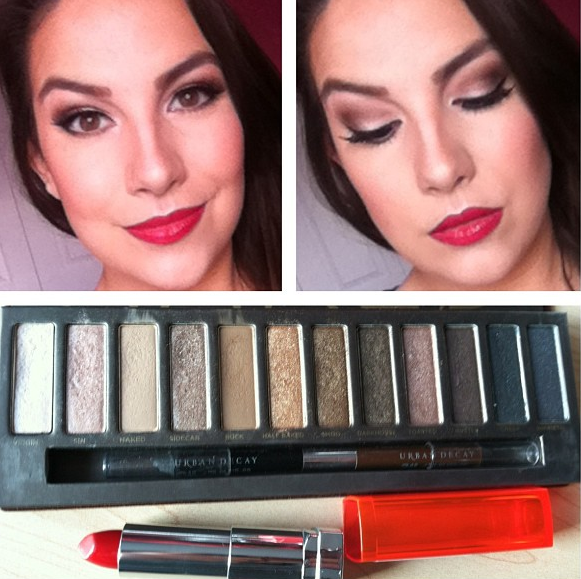 Overall this look incorporates coverage, contouring, neutral yet glam eyes, and a super red lip. While I used a lot of different products for my face makeup, when I looked in the mirror I couldn't SEE a lot of makeup. Why? I believe using various textures (liquid, cream, powder) kept the whole face from seeming cakey. I also misted on some Urban Decay All Nighter Setting Spray. The look still seemed fresh after I passed out on the couch from exhaustion at the end of the night (haha). Seriously though, the day before I found out our family cat Mr. Nut (21 yrs. old, got him when I was in 4th grade) passed away and my eyes were still super puffy on Saturday from all the tears. Thank you, bag of frozen corn, for making them look human again for this event. I've been having my daily chats with Mom since the Mr. Nut situation and as his constant caretaker, she is taking this especially hard, as you would imagine. Thanks to my Twitter friends for the thoughts, prayers, and kind words. I shot a Valentine's tutorial today, which I plan to post tomorrow. It's classic "pretty" with a twist. awesome look, you're so beautiful! You are a red lip kind of gal, for sure! Gorgeous! Sorry to hear about your long time buddy and friend, Mr. Nut!...I loved all the info in your blog. So sorry to hear about your childhood pet passing away. Losing pets is so difficult. My thoughts are with you and your family. This is a beautiful look! I love the ideas for using the Naked palette; sometimes I feel like I go back to the same shades over and over again, so this gives me inspiration to try something different with it! Also, I'm so sorry to hear about Mr. Nut. Sounds like was a very beloved cat! Sending lots of good thoughts to you and your family. Losing a pet can be so hard! That look looks stunning on you! I am so sorry to hear about your cat! :(( My family cat died a few years ago at the age of 18 and until this day I get sad every time I think of him. Pets become our family members for life! And you look beautiful as usual, thank you for the great tips! I LOVE the way you posted this, with the swatches of the eyeshadows in order and the fact that you swatched them! Since most people seem to think we ALL know what these colors look like -__- lol (I do not own the Naked palette) but this look looked amazing on you!! Sorry about your old friend :( I had a tough time when my dogs died and I only had each for a lot less time and I was heartbroken! Prayers for y'all. Very pretty! Did you also get a picture of both your makeup and outfit you could share? Thank you for posting a rundown of this look! I'm always on the hunt for more things to do with my Naked palette. I am so sorry to hear about Mr. Nut. Sending positive thoughts your way for sure. On that note, I used to LOVE LipSmackers when I was a kid. I had pretty much ever flavor they made and I used to match them to my outfit. Vanilla got a lot of play since I decided it was my "neutral" LipSmacker color; same goes for Blueberry because it was the only "blue" flavor and went with denim. LOL. Beautiful look, love it. very red carpet! Absolutely downright beautiful! Are you modelling Emily? If not, you should be! Sorry about your family cat. My "second oldest child" is a 16yr old calico, she was diagnosed with cancer three years ago. They gave her three months to live, but she is still with us.. we know we are on borrowed time though, no matter how much we nurse her. They really do become part of the family. Speaking of cupcake lip balm.. if you do not have the LE chapstick cupcake balms you should. They are at Walgreens (check the Valentine's section, that is where I found mine) and come in Red velvet cupcake and Cake batter flavors. The Cake batter is divine. So sorry to hear about Mr. Nut. :( So difficult. Love the look Emily and Yes, please so a video!! Sorry about your loss Emily. I lost my cat (19 yrs old, I got her when I was 3) a few years ago and I still get tears eyed thinking about her. It's impossible to understand until you go through it, and I feel so terrible for your family. I hope you all are doing ok! Time seems to be the only the that helps. My thoughts are with you guys. I love the pigment of the naked palette, but how do I avoid the fallout? Glitter all over my face every time I use it! Even with an eye primer..